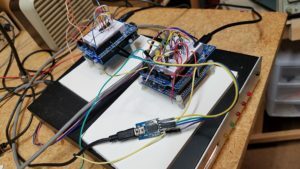 One project I’m working on is to put the packet processing of a conventional TNC onto an Arduino UNO hardware platform. The main goals are for the device to function as a KISS TNC as well as a Digipeater (conventional digipeater and APRS digipeater). The Bell 202 modem would be provided by a single-chip solution on a daughter card. I’ve attached a photo of my software development prototype as it now stands. The back side Arduino board is generating ASCII text strings every 3 seconds that are sent over the RS232 port to the back of the MFJ TNC. The MFJ TNC is operating as a packet encoder and sending HDLC AX25 UI packets to the near side Arduino that’s running my packet test code. The demodulated AX25 packets from the near side Arduino are output to the small nearside board that functions as a TTL Serial to USB converter, so I can monitor the decoded packets on a PC using a serial terminal program like PUTTY.